The well-established diesel engine traditionally powers Van Heck pumps and comes in all shapes and sizes. It can handle tough jobs and high flow rates. By combining different pumps, we can always create a bespoke solution for you. Designed, built and comprehensively tested in house for use in extreme conditions, for example ambient temperatures up to 50 °C. Our pump units are fitted with special air filters, so a dusty building site or even a desert holds no problem for them. The premium quality motors can be used at full load and 24/7. Self-priming pump units, thanks to the combination of the vacuum system and non-return valve developed by Van Heck. 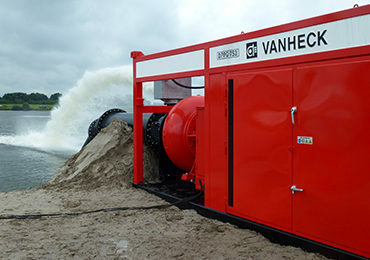 Van Heck Connect allows the pump units to operate autonomously and to be controlled remotely. The sets can be fitted with a diversity of noise reduction systems. The pump units can be supplied with double-walled 1,300 or 3,000 litre diesel tanks, including fuel lines. attains flow rates of 600 to 9,950 m3 per hour. attain flow rates of 40 to 2,900 m3 per hour.